One of the most important and basic requirement for anyone aspiring to venture into the financial world is ‘money value’. Money in many ways is to be treated on par with time. Both of them are to be wisely spent. Knowing the value of money yesterday, today and tomorrow is essential. One generally held belief in the capital market is that the share price of a firm represents sum of present value of all the money to be earned (or liquated) by it’s operations from today till infinity. This statement could not be easily appreciated by anyone who does not know the present value of future money. Rs.100 next year is not equal to the same amount available today. When adjusted for 5% inflation, next year’s Rs.100 would be worth Rs.95 now. Cash flows of Rs100 each for five years in the future does not really equal to Rs. 500 at present. 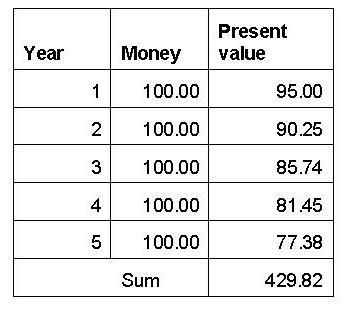 If some one borrows some money from you now with a promise or returning back Rs.100 five years later, the money you are likely to lend him is Rs.77.38 & not Rs.100. Given this backdrop of present value concept, let us now see what could be the present value of a taxi business. Mr.X runs a cab which is likely to earn the following amount of money after paying for driver, police (??) and tax departments. At the end of 3 years, the taxi becomes non-operational and it’s salvage value would be Rs.1.5 lakhs. Given the expected earnings from operations are intact, it is not prudent in paying more than Rs2.8 lakhs for this business. This applies to any investment be it in shares, research, education, bank deposits, lending money or even delaying you dowry. Is this how the EMI concepts work ? This is not how EMI works. It might need another lengthy explanation.